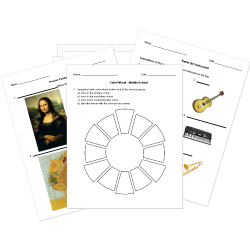 You can create printable tests and worksheets from these Grade 7 Arts questions! Select one or more questions using the checkboxes above each question. Then click the add selected questions to a test button before moving to another page. The French word meaning "step" is pas . The intentional arrangement of objects to create a focal area, visual movement and unity. The quality of neatness and attention to detail in an art work. Dialogue is what drives all good screenplays. Choose the correct note from the following picture. Symbol that represents the length of silence. The speed of the music. What is the name of the clef used for higher pitched instruments/voices? What media might an artist use painting? There will be a at the end of a piece of music.